The styling pens of the design house have made automobiles from various manufacturers look beautiful since the 1930s. Now, however, it is about to become an automaker in its own right. Sticking with its strengths, it’s not going to suddenly begin engineering drivetrains. For that, it is turning to outside companies. But instead of the using the long-established OEMs with which it has previously partnered, it is turning to new ones with high-performance electric drivetrain expertise. Its first vehicle, the Pininfarina PF0 hypercar, will have its running gear supplied by Rimac Automobili. According to Autocar, the next offering from the firm will be an SUV called the PF1. And, they say, it will incorporate the formidable skateboard created by Rivian. We should note that at its stand at the L.A. Autoshow, the company had an example of its platform hanging from its own display. Maybe that was a hint that this foundation was its own separate product. If the collaboration actually happens, prepare to see a beautifully-styled SUV capable of 0-to-60 mile-per-hour sprints in the 3-second neighborhood. 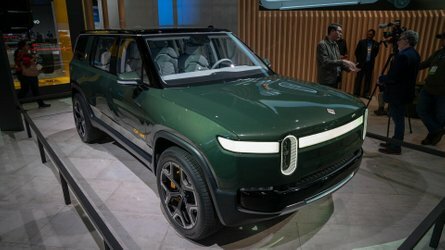 Autocar suggests that, like the Rivian-branded products, the PF1 will come with a choice of three different sizes of battery pack. The largest would return 400 miles (640 km) or more of range. Though it would also feature 4 independent motors — one for each wheel, which would enable the ultimate in torque vectoring performance — we imagine it would a little less off-road oriented. The Pininfarina FP1 would almost certainly take aim at a slightly more upscale audience and have a price tag to match. Previous Previous post: Tournée de 5 étoiles aux crash-tests Euro NCAP ! Next Next post: Volkswagen : un buggy électrique en préparation ?